Where do I use my UK Breakaways voucher code? As one of the UK’s Leading domestic tour operators, UK Breakaways is a trading division of National Holidays and provides holidays for over tens of thousands of holidaymakers every year. Featuring over 100 fantastic value hotels and holiday centres throughout the UK in some of the UK’s most popular Cities, Seaside resorts and secret, scenic corners. Many also include 2 for 1 bar meals and evening entertainment included. For the travellers who enjoy the freedom of exploring with their own car, there is a wide array of exciting breaks to choose from including seaside hotels or larger affairs including indoor pools and singing and dancing facilities. For families, there is even 6 Pontins resorts including on the site! From holidays and weekend breaks to Pontins holiday centres and tribute weekends at first-class hotels, UK Breakaways have something to suit every taste and budget so you’re guaranteed to find a deal you love. UK Breakaways also go the extra mile as they know that their customers may want added extras and something a little different. It’s, for this reason, they have a range of products including low-cost bars and evening cabaret entertainment plus a huge selection of theatre, concerts, musicals, sporting, comedy and special event breaks across the country! Whatever type of break you’re looking for, you’re bound to find it with UK Breakaways and with the added bonus of a money-saving Discount Code courtesy of us, you could be paying a lot less when you book online today! If you’re feeling a little unsure of where you want to visit for your next UK Break, why not check out the ‘Inspire Me’ section online at UK Breakaways. With so many exciting locations and activities to choose from, it can be a little overwhelming however here you can see all the different individual places available to you. Have a browse and choose places which stand out to you and choose your favourite, it’s as easy as that! Once you have decided, find a hotel deal to suit you and head to the booking page and your next break could be sooner than you think! We here at NetVoucherCodes know just how important travelling is to you which is why we want to make it accessible and hassle-free as possible. It’s for this reason we partner with UK Breakaways to bring you all the best deals and discount codes to help you save money when you book online. You can find all of these featured on our UK Breakaways Deals Page right here at NetVoucherCodes so take a look and see what bargains you can pick up. If it’s a coastal getaway you’re in search for, you have come to the right place! Enjoy a spectacular value short break to some of the UK’s most popular seaside resorts including top class hotels, entertainment and bar deals. The UK’s coastline is packed with a diverse array of choice, from the bright lights and bustle of Europe’s busiest resort, Blackpool to the calm and tranquil Cornish Coastal village of King Arthur’s Tintagel and that’s not all. With 19 resorts on site including Bournemouth, Brighton, Great Yarmouth, Scarborough, Southport and many more, whatever you’re looking for, the UK really does have it all and it’s awaiting you right now at UK Breakaways. What happens once I have booked my holiday? Once you have booked your holiday, UK Breakaways will send you a confirmation within 7-10 days. Please ensure you check all of the details and let them know immediately if something appears to be wrong. If you choose the convenience of booking online, your confirmation will be emailed to you immediately. If you’re wanting to cancel your accommodation for any reason you must put it into writing as soon as possible and email it to the Customer Service Dept. at UK Breakaways and they will then send you a cancellation invoice which will show any cancellation charges along with any refund due. In all cases, deposits are non-refundable. Uk Breakaways offer a wide array of breaks across the UK. From short weekend getaways, romantic spa breaks, longer holidays and much more - if you’re wanting to travel in the UK, Uk Breakaways is the place to start your search. From seaside hotels, holiday centres and 4-star country escapes, there is an accommodation to suit all types of budgets and a location you're sure to love! From Blackpool and Liverpool to Bournemouth, Newquay and London are just a handful of the destination available to you. All you have to do is browse online today and find your perfect UK Break including Accommodation and you can even choose from a range of trips and excursions. 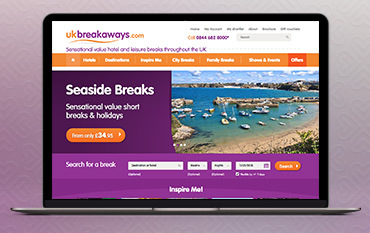 See what UK Breakaways can offer you today and don’t forget to add a UK Breakaways Voucher Code onto your booking to save money on your next trip! We are constantly on the hunt for Voucher Codes for UK Breakaways to help you with your money saving. Our experts check dozens of sites for secret codes including NHS discounts, student sites & social media channels saving you time & money!